The Global Gaming Expo (G2E) is the world’s premier casino-entertainment event that features the latest and greatest in the gaming world. The expo, held at the Sands Expo and Convention Center, kicked off this week and already there has been some big news concerning online poker. 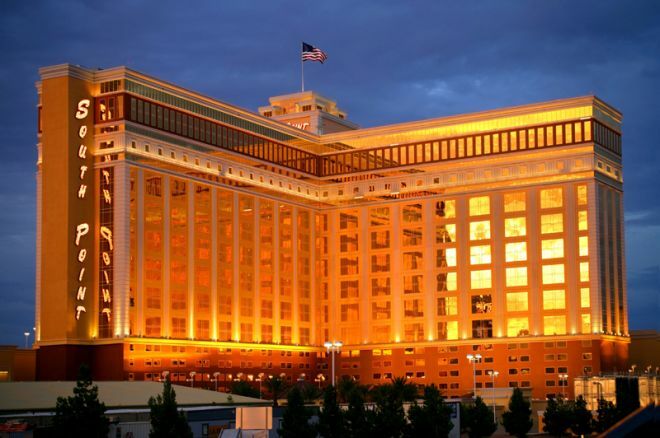 On Wednesday, Michael Gaughan, owner of the South Point Hotel, Casino & Spa in Las Vegas, announced the debut of SouthPointPoker.com, the first free-play online poker site launched by a casino-based and state-regulated property. Not only is the site 100% free, it is 100% legal, and was even approved by the Nevada Gaming Board, though it is not licensed by that body because the site is ratified as a casino promotion. We first reported on Gaughan’s intentions to delve into the online realm in September. It included his plan to use the Zen Entertainment platform, which has hosted free-poker site for the likes of the UFC, World Wrestling Entertainment and NBCSports.com. "The ZEN Entertainment Network, is the leading free-play games network offering players competitive tournaments for prizes in an environment that’s U.S. legal, free, and safe." The Network provides players with "a diverse selection of tournaments to enjoy, many of which are sponsored by celebrities, national brands and manufacturers, movie studios, and other marketers seeking to present their products to ZEN's highly engaged casual game audience." SouthPointPoker.com launches Thurs., Oct. 6, 2011, and will initially be available to South Point Hotel’s Club members. On Monday, Oct. 17, 2011, the site will become available to players the world around, including those in the United States. Players will have their chance to compete for $100,000 in cash and prizes each months, plus there will a $10,000 World Series of Poker Main Event seat given away each and every week. If you’re interested in gaining early access to SouthPointPoker.com, you can register simply by visiting www.SouthPointCasino.com. While you’re at it, be sure to follow them on Twitter, @southpointpoker, for all the latest news and promotions. PokerNews caught up with Gaughan to get a little more information about this brand new option for online poker players. A lot of casino properties have taken a stand against online poker, but you have been a vocal advocate. What made you decide to pursue online poker? I did not want to get left behind or trampled by the herd. Does this mean you think online poker will eventually become legalized and regulated? That’s what everybody says. Nevada passed online intrastate gambling in 2001. They haven’t written any regulations about it, but they passed it. Supposedly the Nevada Gaming Commission is going to come out with regulations for intrastate in January of 2012. So, what I’m trying to do is learn. I’ll probably apply for an intrastate license, and hope to get an interstate license if the Feds ever decide to pass anything. Why did you choose this time to launch SouthPointPoker.com? Likewise, what inspired you to choose the 2011 G2E to make the announcement? The site is 100% free and 100% legal and players can win prizes. What sort of things can they win? That’s in the Zen Entertainment Platform, other than the $10,000 Main Event seat every week — that’s all me. The $100,000 in cash and prizes is with Zen. So anywhere from a small prize up to as high as $2,000 to $3,000 in certain tournaments. How did this deal with Zen Entertainment come to be? Did you reach out to them? Yes. They’ve been doing free sites for other people. I picked Zen because number one, I think they’re very good. Number two, they’re local. Number three, I got into business with them in about three months. Four, they deliver good customer service, and five, I’m comfortable with them. They seem like very nice people. The relationship was very good. So is the intention of this free site to sort of pave the way for a real-money site, if and when that becomes legal? Right, if I can get a license in January, I will go with an intrastate, real-money site, and keep the free site. Can we expect the South Point brand to be incorporated into SouthPointPoker.com? In other words, what sort of qualities from your land-based casinos can we expect to see online? My reputation is pretty good in the industry. My father and I have been licensed between the two of us for over 70 years. I only have 46 years, he’s got 71 years. We’ve been in Nevada a long time, we have a good name. My site was reviewed by the Nevada Gaming Board, and they have no objections as long as it’s free and I follow the guidelines. They don’t license me because it’s ratified right now as a casino promotion, so I had to run it past them. It is not licensed by the Nevada Gaming Board, they approved what I’m doing. Many sites have gone to a subscription-based service, how come you didn’t chose this option? I can’t do a subscription site, it’s not allowed under Nevada regulations. That’s charging money. I think a few of the casinos tried that awhile back and they both got shut down. Do you have a number in mind in regards to how many players you’d like to get for SouthPointPoker.com? I’d like to get between 200,000 to 300,000 within the next year and a half. I’ve hired some good people to work on this. A lot of projects like this will recruit ambassadors or a team of pros to represent the brand. Do you have any plans like that? [Laughs] No, I think all the pros are running for cover right now. Are you a poker player yourself? I don’t play well. My games were five and seven-card stud. I still can’t figure out Texas hold’em. I’m very old school. Don't forget to follow us on Twitter and like us on Facebook.